Who'd call a river the Beck? It's tautological, surely, as any Northerner knows. But the Beck isn't northern, it's a south London river, running approximately up the western side of the borough of Bromley. 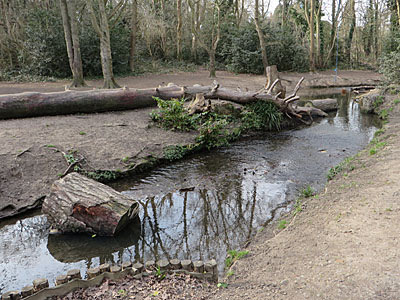 It's also the river that flows through Beckenham, which might make you say "well yes, of course," except the origination's not the way round you might think. Beckenham's thought to be named after a Saxon chieftain called Beohha, and the river Beck is named after the town, or rather village as it was at the time. It's also a rather sweet little river, in places, and rather more unlost than some. The Beck rises on a long wooded ridge between Addington and West Wickham, with thick trees shielding any view of either. It's a fairly obvious place for a river to start, indeed there's a spring line along the brow of the slope, and the wooded area goes by the name of Spring Park. The Beck actually starts to the north of of Threepenny Wood, with which you'll be familiar if you've ever walked London Loop section 4 (and probably not otherwise). A path leads off through the trees, increasingly untrodden, to a small clearing where a concrete-coated pipe pokes out of the earth. This is the visible source of the Beck, here narrow enough for a toddler to straddle the channel as it almost-trickles through the undergrowth. A thin tongue of woodland stretches north between some nice houses on the Bromley side and some lowbrow flats on the Croydon side. It's no coincidence that the two boroughs meet here, because the fledgling Beck marks the dividing line between the two. More importantly it once marked the precise boundary between Kent and Surrey, until Greater London swept out fifty years ago and pushed the Home Counties back. On a midweek afternoon the woods feel quite cut off, the opposing estates held back behind gateless fences. The river ducks between birch and holly trees, carving a muddy notch in the earth overhung by spindly branches. In a capital city whose rivers are often little more than concrete culverts, this is very minor, but very real. Emerging from the trees, the Beck continues unseen behind the backs of houses. Unseen that is unless one of these houses is yours, in which case it makes a particularly nice water feature crossed by an ornamental bridge topped with shrublets... as can be seen if you peer through a knot in the fence down the first cross-river alleyway. But that's the last sight for half a mile, forcing the riverwalker along Reggie Perrin avenues to the main Wickham Road. The building ahead by the riverside used to be La Rioja restaurant, but KFC have plans to create a drive-through instead and local residents are livid. The planning application was submitted last week, hence the Say No To Drive Through KFC at La Rioja Site West Wickham Facebook group members are busy leafleting at the moment, and an online petition is in full effect. Up next is High Broom Wood, which is lovely. This secluded linear strip of woodland follows the River Beck corridor, accessible only at top and bottom, but with well maintained footways to either side. A band of volunteers have done sterling work keeping fifteen acres well-groomed, adding a couple of footbridges and the occasional carved animal too. The river weaves between the trees following pools and riffles, a geography teacher's delight, while unseen songbirds bring the upper branches to life. If KFC get their way a new entrance will be added from the south, which could be both very good (access!) and very bad (litter!). In the meantime I found my way in from Monks Orchard Road, which is how I happened to be passing Bethlem Hospital and its new museum... but that was yesterday's post. North of the Eden Park roundabout the Beck again runs unseen through private land. A sports ground and a secondary school playing field are first, then an enclave of inaccessible woodland through which a brief tributary flows. Next up is a primary school, the bridge by its entrance clearly not the best place to hang around with a camera midweek, and thence to the enormous campus of Langley Court. This used to be a major research hub for pharmaceutical firm Glaxo Wellcome, until closed 20 years ago, and the non-Beck part is now covered by a large mixed residential estate. For us mere mortals the river doesn't reappear until the upper part of the Harvington Estate, rather wider now, meandering past landscaped tree trunks and a dangling blue rope swing. Compared to most unlost London rivers, the Beck is somewhat spoilt for scenic sections. Kelsey Park is a case in point, Beckenham's finest recreational space, created from the remnants of the Kelsey mansion estate. 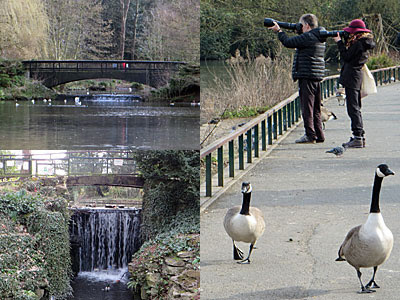 A succession of wealthy owners in the 18th century landscaped the river to add two lakes and a waterfall, which now form the centrepiece of a much-loved linear park. Much-loved by parents and toddlers hanging out at the cafe by the playground, much-loved by the retired couples who wander the banks with bags of bread, and much-loved by a heck of a lot of ducks and swans and geese who flock the waterside and gardens. This is the sort of park that publishes its own calendar, and without the Beck it'd be nothing. And that half-kilometre is as good as it gets. Soon afterwards the Beck dips into culvert to pass through the centre of Beckenham, beneath the High Street, long buried as a barrier to commercial activity. It re-emerges along the back of Church Avenue, now confined to a bland concrete trench, in which it remains, occasionally reappearing between semis or across the front of a trading estate. 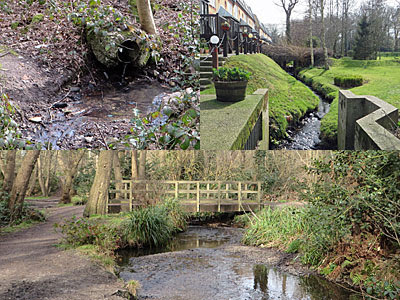 Burrowing beneath two railways brings the Beck to Cator Park where it joins the Chaffinch Brook, in a landscape feature that brings the concept of "bland concrete trench" to new heights. And at this point both tributaries change their name, if not their construction material, combining to form the Pool River which continues north. But that's for another day.